The maker movement has a similar trajectory to that of the personal computer revolution. The maker movement is known to the past generations as “DIY” (do-it-yourself), it encourages collaboration, invention, and radical participation with a single goal: to create new things. But it is far different from the old "DIY" way with the aid of 3D printing in 21st century. The Economist pointed out that the maker movement and 3-D printing play an important role in the Third Industrial Revolution. They will not only transform manufacturing, but also the very way we conduct the totality of commercial life in the first half of the 21st Century. Public awareness of 3D printing technology has arrived a tipping point in Hong Kong this year. However, this technology has been invented since the 1980’s. So why is it just now coming into its own? What makes it so different now? And will 3D printing and the maker movement live up to the media predictions as the manufacturing revolution of the future? In the first part of this talk, different components such as Hackerspace, Fablab, open-source software and hardware of this global maker movement will be covered. The democratization of making things will be focused. In the second part of this talk, the history of human manufacturing to the present day will be briefly introduced. The common 3D printing techniques and material will be discussed. The speaker will also explore some current and future uses, applications and legal implications of the technology. The landscape of the 3D printing industry today will be briefly covered. 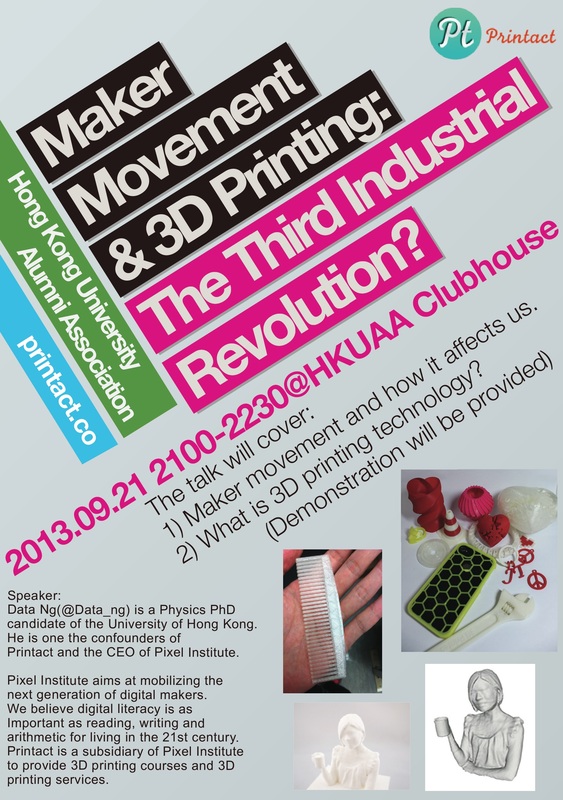 Demonstration of 3D printing and 3D scanning will be provided in this talk. Data Ng(@Data_ng) is a Physics PhD candidate of the University of Hong Kong. He is one the cofounders of Printact and the CEO of Pixel Institute. Pixel Institute aims at mobilizing the next generation of digital makers. We believe digital literacy is as important as Reading, writing and arithmetic for living in the 21st century. Printact is a subsidiary of Pixel Institute to provide 3D printing courses and 3D printing services.